UPDATE: VNV dropped out of the tour and got replaced by Frontline. One of these things is not like the others… But I want to share, OK? If you make a Venn diagram of the way nerdy interests overlap, it will be plaid. Furries are nerdy. Many nerds love cool music. Some furries like industrial music. 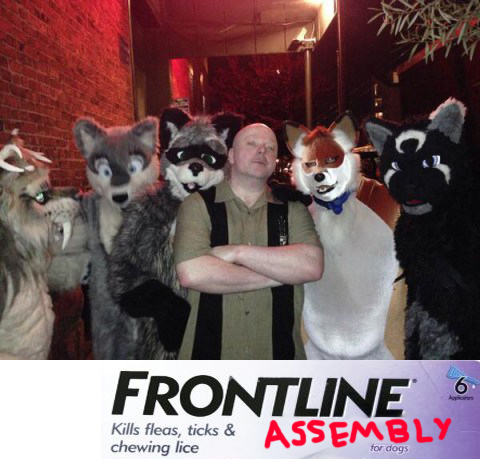 Pictured: Ronan Harris from VNV Nation, giving no fucks with furry friends outside a 2013 show at Slim’s in San Francisco. All the furries from last night’s VNV show pose for a moment with Ronan Harris. After he got a change of clothes and got off the bus, he dodged past a LONG line of waiting fans just to seek us out. Seems pretty surreal when the star of the show seeks you, the fan, out. Turns out his wife still has pictures of us in costume from the last tour. Thanks, Agnieszka! VNV Nation is on tour again with 3 more top bands, and some furry music fans are excited! Tickets are here for the December 19 show in San Francisco. Do you like links? How about samples of stories to come? Here’s some little treats. These snausages might become a regular feature.